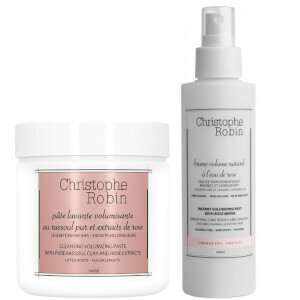 Treat fine hair to the benefits of Christophe Robin Delicate Volumizing Shampoo and Volumizing Conditioner; a high performance duo that work in tandem to cleanse, hydrate and enhance body from root to tip. A lightweight shampoo that gently cleanses fine, coloured and sensitive hair as it improves colour vibrancy, volume and softness. Enriched with Centifolia Rose Water and Baobab Leaf Extract, the gel formula nourishes and strengthens hair, whilst providing antioxidant properties to keep tresses looking vibrant and lustrous. Ideal for fine, coloured and sensitive hair, the replenishing conditioner expertly detangles and nourishes from root to tip. 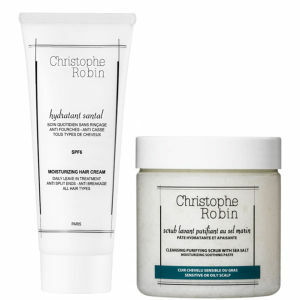 Fortified with Musk Rose Oil and Centifolia Rose Water, the luxurious formula delivers long-lasting moisture and hydration, whilst creating natural volume and lift without drying or weighing hair down. 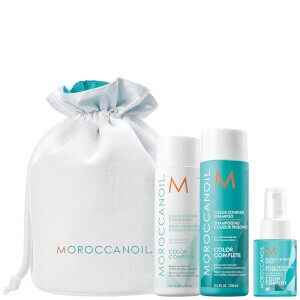 Conditioner: After shampooing, apply on the hair's lengths and ends only. Leave in for a moment, then detangle hair and rinse thoroughly. Shampoo: Aqua (Water), Sodium Lauroyl Sarcosinate, Cocamidopropyl Betaine, Glycerin, Acrylates Copolymer, Disodium Cocoamphodiacetate, Hydrolyzed Adansonia Digitata Extract, Rosa Centifolia Water Extract, Rosa Moschata Seed Oil, Rosa Gallica Extract, Polyquaternium-16, Xanthan Gum, Peg-150 Distearate, Guar Hydroxypropyltrimonium Chloride, Deceth-7, Peg-40 Hydrogenated Castor Oil, Citric Acid, Parfum (Fragrance), Ppg-26-Buteth-26, Sodium Hydroxide, Sodium Chloride, Disodium Edta, Phenoxyethanol, Citronellol, Geraniol, Carbomer, Potassium Sorbate, Sodium Benzoate, Benzyl Alcohol. Conditioner: Aqua (Water), Cetearyl Alcohol, Glycerin, Ethylhexyl Stearate, Cetrimonium Chloride, Helianthus Annuus (Sunflower) Seed Oil, Plukenetia Volubilis Seed Oil, Prunus Amygdalus Dulcis (Sweet Almond) Oil, Prunus Persica (Peach) Kernel Oil, Guar Hydroxypropyltrimonium Chloride, Hydrolyzed Rice Protein, Vaccinium Myrtillus Leaf Extract, Citric Acid, Parfum (Fragrance), Tocopheryl Acetate, Retinyl Palmitate, Disodium Edta, Sodium Benzoate, Benzyl Alcohol, Potassium Sorbate, Tocopherol.